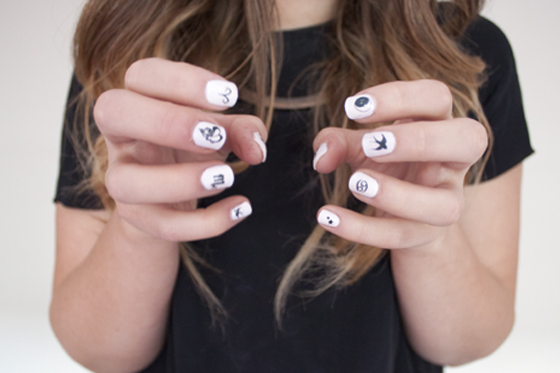 I've seen these nail art tattoos on the Topshop website a few times before and considered buying them but they disappeared before I managed to buy any. I saw these in the Oxford Street store a few days ago when I went shopping with Zoe. I kinda didn't want to spend my money on something that might not work, but I love nail art too much not to try something like this. 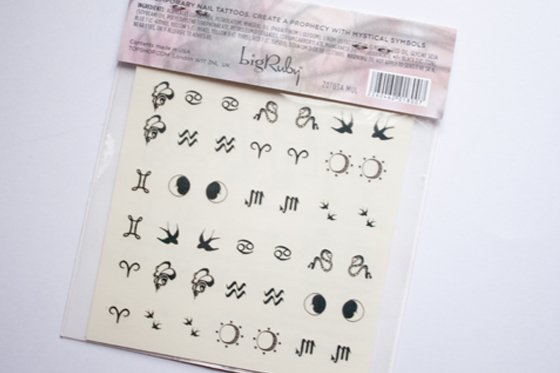 This nail tattoo collection is called "sisters of the New Moon" and the images are mainly star sign and galaxy inspired with a few swallows thrown in for good measure. 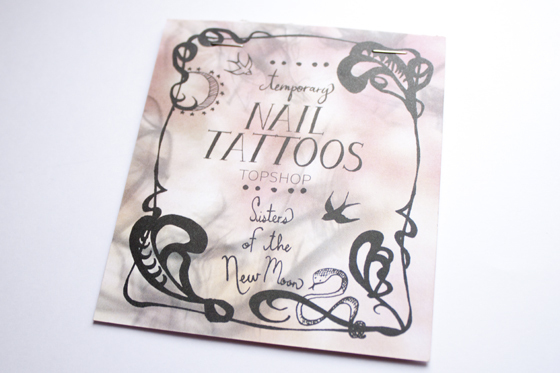 The Topshop nail tattoos are relatively easy to put on, You apply them like you would any other transfer tattoo by cutting to size and wetting the tattoo with a damp cloth and then pressing on the nail. You then top it off with clear polish so it doesn't rub off. For a first attempt I don't think they turned out too badly, they aren't perfect though. Make sure you cut as close the the design as you can before wetting it, I found it also helped if I cut it, removed the backing paper then dipped the transfer in water first then applied it to the nail and dabbed with a cloth. It just mean the paper was easier to shape around the nail. Its a cool idea but I really don't see the whole nail tattoo thing taking off in the same way some nail art has done in the past. 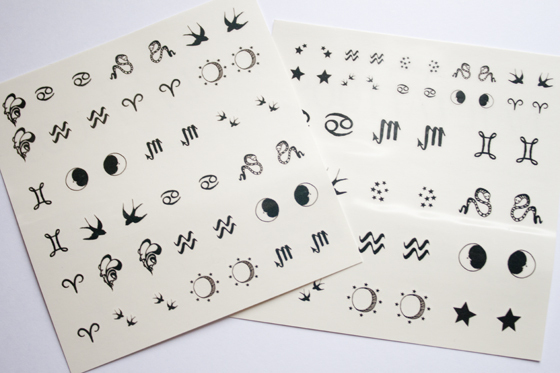 The nail tattoos are really gimmicky but the results are pretty cool. I hope they bring out other patterns because they do look good if your not that good at nail art. They aren't as fiddly as they look and takes about 10 minutes maximum to apply them to your nails. They'd make perfect accent nails or if you wanted a full manicure in all the patterns like I did! There are plenty of shapes and sizes for different nails so I wouldn't worry about them not fitting either. Overall Id recommend them, for £7 its not that bad for something you could get plenty of different nail art designs out of! so cute! and great for £7! They look awesome, great alternatives if your not handy with a nail art pen. I'm really intrigued by these! I haven't actually got round to trying any nail art yet but I do love how it looks on other people. Ooh they look lovely.. It would be cool if you could do a review of the Meadham and Kirchhoff nail transfers as well.. I've only seen one review on them before and they pointed out some problems with the sizes. this reminds me of stuff i had when i was a young girl. i really like how they turned out though, and sometimes gimmicky can be really fun at least. they actually seem to be nicer than nail stickers, since they aren't raised. you can just paint a clear top coat and they should be good to go. i have used nail stickers before with designs like hearts and things, and even with a clear top coat, their edges always seem to get caught on something and come off! Oh wow! Those are fab! These are so cool!! :) I need to get some!